We exist to create an environment and a culture that breeds success by caring for our customers as individuals and enabling our people to be the best that they can be. We focus on helping people to be successful: the people who work for us, the people who engage with us, and the people who use the systems and applications we design, build, and operate. We are looking for highly enthusiastic software professionals that are passionate about Java, Code Quality, Continuous Delivery and Continuous Improvement. 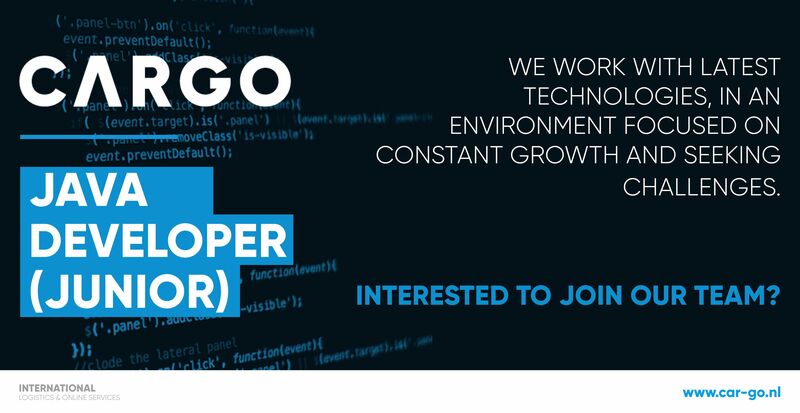 You will have the opportunity to work together with one of our software providers in an Agile environment on projects that are under end to end responsibility of the Project team. We work with latest technologies, in an environment focused on constant growth and seeking challenges. Your main responsibilities will be to develop software systems, participating in logical and technical design of the product and understanding the business requirements. You will solve from simple to complex technical problems, review and preserve the quality of code written as an integral part of a Scrum team. Analyse existing code base and propose/design pragmatic amendments. Cargo International is an independent and specialised partner in im- & export. Whether it concerns customs affairs, export documentation or shipping goods internationally, we have the knowledge and experience to help our customers. We provide our customers a web based application for all required im- & export formalities, online publishing and Dutch vehicle authority (RDW) services for car dealers. Please send your CV and motivation to robin.johannesma@car-go.nl or contact Robin Johannesma on +31 (0)6 41 609 382 if you have any further questions regarding the job description.